The morning of Thursday 8th June was always going to be special for me, not just because I was driving a car for the first time in the US, but for the reason I was visiting Nellis AFB for the first time. We hired the car (me and my girlfriend Catherine) and set off from the Paris Hilton Hotel, Las Vegas. 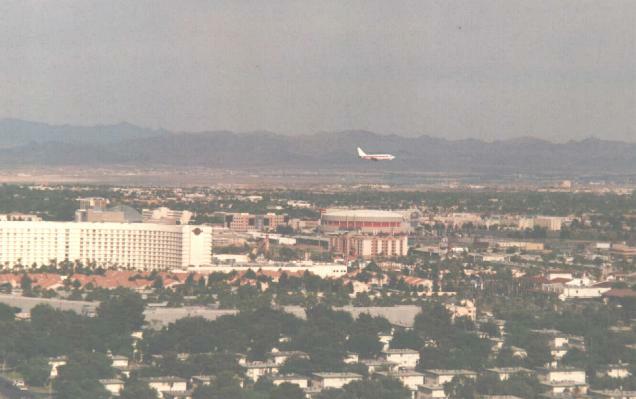 By the way we had a great view of the Janet Terminal from out hotel window, and I tried to follow the flights with my scanner but I always lost them as they changed from McCarran Tower frequency. There always seemed to be five or six 737's in the evening and when I woke up in the morning there was normally only one there. 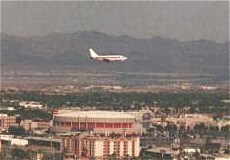 Then around 17.00 they would all start to return, I got a decent photo of one passing over the Hard Rock Hotel on it's approach into McCarran. Anyway Thursday morning we set up base between the two runways at Nellis, at first it seemed to be rather quiet, even though I could make out the flightline with my binoculars and what seemed like a mass of warplanes. It was'nt long before we started to see some action, from the position we was in (the northern end of the base) the aircraft departed towards Vegas on runway 21L or 21R then made a hard right turn northwestwards towards the ranges. On the aircrafts return they would fly right by us on the approach to land. During the five hours we where there we saw large formations of F-15C's and E's, F-16's, A-10's, F-18's, KC-135's, B-52's and B-1's. 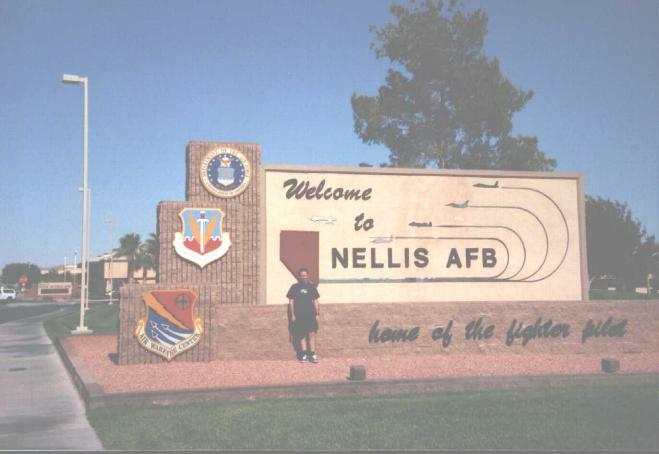 After watching all the action we drove down to the main gate at Nellis and had my photo taken outside the massive Welcome to Nellis AFB sign which is really cool. 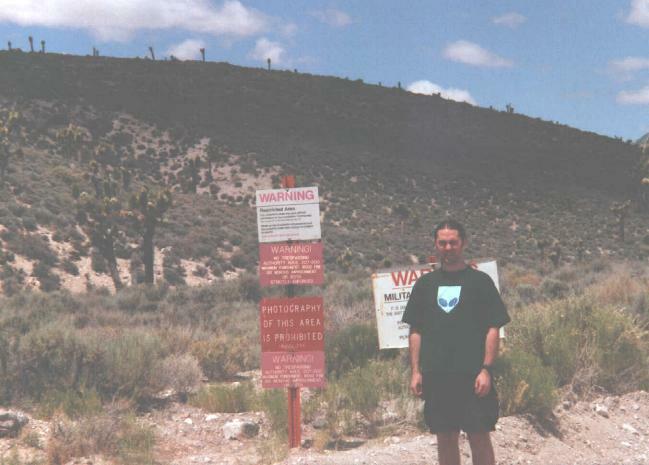 And then there was the security aspect on our way down Groom Lake which I started to think about as we got nearer. We stopped for gas a few miles from Nellis where we was greeted by two very heavily bombed up F-16's on there way to the ranges. After topping the car up we turned onto US-93, and what a great road this is. The road just goes on for miles upon miles of straight blacktop, so I just turned on cruise control and sped on northwards taking in the desert scenery. As we came upon Alamo we stopped and filled our car up again,we had hardly used any gas but it was better to be safe than sorry. 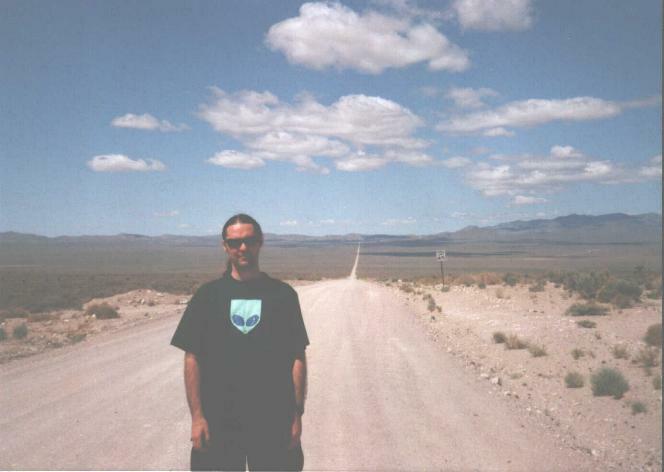 We then turned onto the ET Highway 375 and stopped for photos under the road signs (as one does). I must have had about twenty sheets of A4 paper on me with information from this website about directions, maps, frequencies and such like, they where very, very useful, infact I would'nt have done the trip if I had'nt all this info. We must have been travelling for about nearly three hours untill we saw GLR in the distance, we stopped and got out at the top of the road and looked down. I could'nt believe how quiet and still the surrounding area was, it was very eeire. But what the hell we had travelled thousands of miles from England and no dirt road was going to stop me from getting down to the border even though my stomach started to churn slightly as we drove down the road (and that was just thinking about what our car hire firm would say if they found out about driving on this road). We took our time on our way down stopping every now and again and trying to miss any nasty sharp looking rocks. We also stopped to have our photos taken next to the Joshua Trees on GLR and pretended we was U2, even though we was probably being watched. It took about twenty-five minutes untill we got to the border and was surprised to see a few slight hills before the signs which I was not expecting,so I had to put my foot down on the gas to get over them, but no worry. We stopped a slight distance from the border,and walked over to the signs to take some photos and take everything in. There was a Cammo Dude watching us from the big hill on our left hand side which made me smile, just to think where in the world I was at this moment in time, I just could'nt belive I was here. If anyone as any doudt what so ever about things going on or not going on at this base they only have to make the trip from Vegas, then drive down GLR and see the Cammo Dudes patrolling the border in the middle of nowhere with there own eyes. What happened next I have described on the Disscussion Forum on this site and left me in no doudt that they are testing top secret aircraft at Groom. Just as we was making our way from the signs we heard the most awesome sounding jet engine noise coming from behind the hills in front of us. It lasted for about ten seconds then it suddenly stopped. When I heard the noise my stomach churned ( no I am not exaggerating ) and I was expecting to see some large black stealth aircraft to come into view, but alas no luck. I could tell the noise was coming from a fair distance away when we heard it, but I think that is what made it so curious, as it was very, very powerful sounding. Even my girlfriend who is not really well up on such matters could'nt belive how mega sounding it was. After we had heard the noise we thought we had better set of to Rachel as I was beginning to think we had outstayed our welcome at the border of Americas favourite secret base. We got back into the car and just as we where driving off a white jeep came speeding past us about fifty miles an hour with blacked out windows and blank numberplates, which left us in a cloud of Nevadas finest dust. I was quite angry for a moment and was going to sound my horn at him but then thought better off it when his brake lights come on. I thought great, end of holiday, where going to be deported back to England (if where lucky) and we did'nt even cross the border. Anyway not to worry even jeeps with blacked out windows and blank licence plates have to slow down over hills, which is what he was doing. We drove back up GLR took a few more pictures looking towards 375 then turned left towards the Black Mailbox, then Rachel. On our way to Rachel we noticed the big mountain on our left with radar /survillence kind off stuff on top. This we found out in The Little Ale Inn was Bald Mountain which kept an eye and hear on the surrounding area. We finally got to Rachel and had a slap up meal in the Ale Inn (the famous AleInn Burger, what else!) I had a good look at all the photos and was surprised to see pictures of Rachel covered in snow. I know the weather can turn pretty nasty in winter round here, and here was the proof. I spent quite a fair amount of money on gifts for the folks back home and myself. Then we said our goodbyes. Before we set off back to Vegas we had a look in the Area 51 Research Centre and got talking to a old guy about all things military. He had a few models of aircraft on his desk and I told him the Tornado model he had would have been made and test flown a few miles from where I lived in England. He told me about all the sightings around Rachel and the surrounding area, he also said how great it is around these parts when there is a Red Flag on at Nellis. I mentioned the noise I heard at the border a hour or two before and he reckoned it might have been one of the new hypersonic spyplanes Groom Lake where supposed to be working on. He told me about all the strange noises which had set off earthquake sensors in Northern California. If the noise I had heard was a engine/taxi run test test of some kind I would'nt be surprised. Time was getting on so we set off back the way we had come, past the Black Mailbox, and past the top of GLR. We could'nt just drive past without stopping for one last time and having another look.I then noticed a trial of dust in the distance going down the road towards the border so I got my binoculars out and saw a red car in the distance. I also then noticed a Cammo Dude a few miles away from the red car coming towards them. The Cammo Dude then turned off GLR without (we think) the red car seeing him.The red car drove past and after a minute the jeep turned and followed keeping a fair distance behind the red car. I wonder if this happened to us when we drove down GLR, no big deal as long has they did'nt hassle any of us. We topped of the car with gas again in Alamo and made good time on our journey back, although I was getting tired. By the time we arrived at the Paris Hilton we had driven just under four-hundred miles. To round things off we had a great time during our time in Vegas, especially the two days at Nellis /Rachel and Groom Lake. I would love to go back again one day to Nellis during a Red Flag and perhaps stay a night in Rachel, maybe next year.